Foredrag – Dagens skogressurser og hvordan blir tilgangen av hogstmodent virke framover? Hylen, G. 2019. Dagens skogressurser og hvordan blir tilgangen av hogstmodent virke framover? (Foredrag). Utvikling av jernbane- og havneinfrastruktur for eksisterende og framtidig industri i områder langs Sørlands- og Bergensbanen, Drammen. Hylen, G. 2019. Landsskogtakseringen som miljøanalyse (Foredrag). NIBIO konferansen 2019, X Meeting Point på Skjetten utenfor Oslo. Root rot in Norway spruce (Picea abies (L.) Karst.) causes substantial economic losses to the forestry sector. In this study, we developed a probability model for decay at breast height utilizing 18,141 increment cores sampled on temporary plots of the Norwegian National Forest Inventory. The final model showed a good fit to the data and retained significant relationships between decay and a suite of tree, stand and site variables, including diameter at breast height, stand age, altitude, growing season temperature sum (threshold 5°C), and vegetation type. By comparing model predictions with recorded decay at stump height in an independent data set, we estimated a proportionality function to adjust for the inherent underestimation of total rot that will be obtained by applying a probability model derived from increment cores sampled at breast height. We conclude that the developed model is appropriate for national and regional scenario analyses in Norway, and could also be useful as a tool for operational forestry planning. This would however require further testing on independent data, to assess how well the new model predicts decay at local scales. NIBIO Rapport, 4(170) 2018. 92 s.
Hylen, G., Granhus, A. & Eriksen, R. 2018. Arealrepresentativ overvåking av skogvernområder gjennom Landsskogtakseringen. [Revidert] Rapport fra taksering utført i femårsperioden 2012-2016. NIBIO Rapport 4(170). 92 s. NIBIO, Ås. Tilgjengelig fra: http://hdl.handle.net/11250/2578710. Rapporten beskriver, og gir resultater fra, «Overvåkingsprogrammet for skog i verneområder» som omfatter nasjonalparker og naturreservater som var etablert pr. 1.1.2016. Registreringene ble gjennomført av Landsskogtakseringen i perioden 2012-2016. Statistikk for arealtyper, skogtilstand og miljøverdier som er viktig for biologisk mangfold sammenstilles. [...] Denne rapporten er en revidert utgave av NIBIO rapport 3(142) 2017, M-921. Kapittel 4.5: Volum, og tilhørende tabeller i vedlegget, er oppdatert på grunn av endring i grunnlagsdata. Kjønaas, O.J., Bárcena, T.G. & Hylen, G. 2018. Carbon stocks and soil respiration rates in paired stands of birch and spruce in Western Norway. Preliminary results from the BalanC project (Foredrag). CAR-ES, Uppsala. Annet – How does tree species change affect forest soil C stocks, C mineralization rates, organic matter stability and microbial diversity? 3rd Conference on Ecology of Soil Microorganisms 2018. Natural resources and bioeconomy studies 29/2018 2018. s. 134. Tree species change has been suggested as one of the government policies to mitigate climate change in Nor-way with the aim to increase the annual uptake of CO2 and the long-term storage of carbon (C) in forests. The strategy includes replacing native, deciduous species with fast-growing species, mainly Norway spruce. A shift in tree species is expected to affect the pools and fluxes of C in the stand as well as the microbial community. As part of the BalanC project, we assess C storage related to shift in tree species cover in western Norway and whether a corresponding shift in soil microbial communities are happening. The study aim at integrating results on soil respiration, C mineralization, soil stability, diversity of bacteria, fungi and micro-eukaryotes, soil nutrient pools, litter inputs and edaphic factors at the stand level in order to identify key drivers for changes in the soil C stocks. Fifteen paired plots of native birch and planted Norway spruce at five locations were sampled. Prelimi-nary results suggests a redistribution of C from the mineral soil to the forest floor in the spruce stands, with minor changes in the total soil C pools over the 45-60 years since the tree species change. The in situ soil respi-ration and heterothropic respiration, as well as C mineralization rates, were higher in birch than in spruce stands. Differences in C mineralization rates attenuate with depth between forest types. The microbial com-munities of the three organismal groups were all strongly structured along the vertical depth. Poster – How does tree species change affect forest soil C stocks, C mineralization rates, organic matter stability and microbial diversity? Kjønaas, O.J., Mundra, S., Bárcena, T.G., Hansen, M., Hylen, G. & Kauserud, H. 2018. How does tree species change affect forest soil C stocks, C mineralization rates, organic matter stability and microbial diversity? (Poster). 3rd Conference on Ecology of Soil Microorganism, Helsinki. Rapport – Skogtilstand og verneverdier i områdene øst for Glomma -sammenlignet med regionale og nasjonale resultater. NIBIO Rapport, 4(52) 2018. 116 s.
Hylen, G., Granhus, A. & Eriksen, R. 2018. Skogtilstand og verneverdier i områdene øst for Glomma -sammenlignet med regionale og nasjonale resultater.. NIBIO Rapport 4(52). 116 s. NIBIO, Ås. Tilgjengelig fra: http://hdl.handle.net/11250/2568367. NIBIO Rapport, 3(142) 2017. 92 s.
Hylen, G., Granhus, A. & Eriksen, R. 2017. Arealrepresentativ overvåking av skogvernområder gjennom Landsskogtakseringen. Rapport fra taksering utført i femårsperioden 2012-2016. NIBIO Rapport 3(142). 92 s. NIBIO, Ås. Tilgjengelig fra: http://hdl.handle.net/11250/2473608. Hylen, G. & Dalen, L.S. (Intervju). 2017. DET BLIR STADIG MER SKOG. Namdalsavisa, 01.09.2017. Rapport – Effects of tree species change on forest soil carbon in Western Norway (BalanC) - preliminary results. 125th IUFRO Anniversary Congress - Book of Abstracts, 2017. Forstliche Versuchs- und Forschungsanstalt (FVA), 2017. 724 s.
Kjønaas, O.J., Bárcena, T.G. & Hylen, G. 2017. Effects of tree species change on forest soil carbon in Western Norway (BalanC) - preliminary results. 125th IUFRO Anniversary Congress - Book of Abstracts, 2017.. Rapport, 724 s. Forstliche Versuchs- und Forschungsanstalt (FVA), Baden-Württemberg. Changes in forest management have been suggested as a government policy to mitigate climate change in Norway. Tree species change is one of the major strategies considered, with the aim to increase the annual uptake of CO2 as well as the long-term storage of carbon (C) in forests. The strategy includes replacing native, deciduous species with fast-growing species, mainly Norway spruce. Forests in western Norway host some of the largest soil C pools in Scandinavia, and may potentially function as a long-term C reservoir as well as a large source of atmospheric CO2 through decomposition. The project BalanC was initiated in 2016 in order to estimate the C storage potential related to tree species in a total of 15 parallel plots of birch and planted Norway spruce at 5 locations in western Norway. In addition to estimates of C stocks in biomass and soils, we investigate soil C processes, soil fungal and earthworm diversity, albedo, and wood product life-cycles. The current presentation focuses on C stocks in soils relative to trees, soil respiration, and soil climate data. Preliminary results indicate that the soil respiration in spruce was 85 % of the respiration in birch, with a span ranging from 55-151%. The preliminary soil temperature and soil moisture data of the spruce stands were 97 and 73%, respectively, of the birch stands, indicating cooler and drier conditions under spruce which may affect decomposition and C accumulation rates. We expect C allocation in the soil to be affected by tree species, with larger C stocks in the forest floor of spruce stands compared to the mineral soil. Consistent differences in the bulk density of soils under each tree species are likely to be observed, pointing out the need to compare soil C stocks based on equal soil mass. The magnitude of the combined C stock in biomass and soil may increase with planting of spruce, however, we also expect an impact on C stability that will affect the overall mitigation effect of this measure. Hylen, G. 2017. Forest resources in Norway & Troms (Foredrag). Fifth (25th) meeting of the “UNECE/FAO Team of Specialists on monitoring sustainable forest management”, Tromsø. Populærvitenskapelig – National level data availability and background for the selection of study sites. 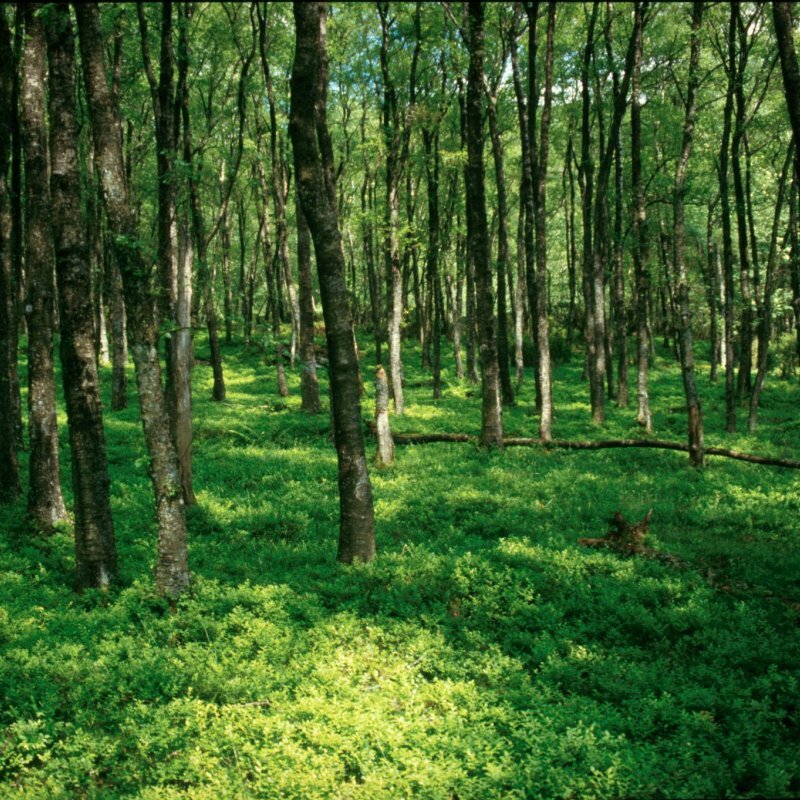 Forest soil carbon changes from measurements and models - Site-specific comparisons and implications for UNFCCC reporting. NIBIO Rapport 114(3) 2017. s. 16-17. Intervju – Norsk skog vokser som aldri før. Hva skyldes den økte veksten? Hylen, G. & Dalen, L.S. (Intervju). 2017. Norsk skog vokser som aldri før. Hva skyldes den økte veksten?. Nationen, 04.09.2017. Dalen, L.S. & Hylen, G. (Intervju). 2017. Norsk skog vokser som aldri før. Skogens årlige tilvekst er doblet siden 1920-tallet. Nå har Norge en samlet tømmerverdi på over 220 milliarder kroner. Forskning.no, 04.09.2017. Hylen, G. & Dalen, L.S. (Intervju). 2017. Ny oversikt over vernet skog i Norge. nibio.no, 22.12.2017. Tilgjengelig fra: https://www.nibio.no/nyheter/ny-oversikt-over-vernet-skog-i-norge?locationfilter=true. Hylen, G. & Dalen, L.S. (Intervju). 2017. Nye rekordtall for skogen i Norge. Bonde og Småbruker, 13.10.2017. Hylen, G. & Dalen, L.S. (Intervju). 2017. Nye rekordtall for skogen i Norge. nibio.no, 28.08.2017. Tilgjengelig fra: https://www.nibio.no/nyheter/nye-rekordtall-for-skogen-i-norge?locationfilter=true. Hylen, G., Mannsåker, T.M. & Dalen, L.S. (Intervju). 2017. Skogen i Noreg veks. Radio Folgefonn, Hardanger og Voss, 31.08.2017. Evaluering av norsk skogvern i 2016. Dekning av mål for skogvernet og behov for supplerende vern. NINA rapport 1352(1352) 2017. s. 24-35. Hylen, G. (Programdeltakelse). 2017. Størrelsen på Norsk skog har tredoblet seg på 90 år. Gro Hylen fra Norsk institutt for bioøkonomi forteller om de som er ute og teller trær. NRK P1+ Jacobsen, 29.08.2017. Foredrag – Hva viser 10. Landsskogtaksering om miljøtilstanden i skogen? Granhus, A. & Hylen, G. 2016. Hva viser 10. Landsskogtaksering om miljøtilstanden i skogen? (Foredrag). Skog og Tre 2016, Gardermoen. NIBIO Rapport, 2(40) 2016. 25 s.
Granhus, A. & Hylen, G. 2016. Prosjektet «Råte i granskog – utbredelse og konsekvenser for valg av omløpstid». Sluttrapport. NIBIO Rapport 2(40). 25 s. NIBIO, Ås. Tilgjengelig fra: http://hdl.handle.net/11250/2380089. Denne rapporten sammenstiller hovedresultater fra prosjektet «Råte i granskog – utbredelse og konsekvenser for valg av omløpstid». Det er gjennom prosjektet utviklet en prediksjonsmodell for råte i enkelttrær med utgangspunkt i forklaringsvariabler som beskriver egenskaper ved det enkelte tre, samt egenskaper ved bestandet, voksestedet og temperatursummen i vekstsesongen. Datamaterialet som ble brukt til å utvikle modellen omfatter nærmere 18 000 borprøver fra Landsskogtakseringen, innsamlet i perioden 1986-2004 i fylkene på Østlandet, Sørlandet og Midt-Norge samt Nordland. Den totale råtefrekvensen i hele datamaterialet som ble anvendt for å lage modellen var på 9,5 prosent. Dette er noe høyere enn den gjennomsnittlige råtefrekvensen på 7,9 prosent som ble funnet av Huse (1983), i en undersøkelse av borprøver fra Landsskogtakseringen 1964-1976. Vi kan imidlertid ikke ut fra dette konkludere entydig at råtefrekvensen i norsk skog er økende. Dette blant annet med utgangspunkt i at det i datamaterialet fra perioden 1986-2004 ser ut til å heller være en viss fallende tendens over tid, når en sammenligner råtefrekvensen fra borprøver innsamlet i henholdsvis første og siste del av denne perioden innen samme regioner. Den utviklede modellen er anvendt på enkelttredata fra Landsskogtakseringens 10. takstomdrev (2010-2014) for å estimere omfanget av råte gitt dagens skogtilstand, og for vurderinger av prioritering av bestand for avvirkning. Modellkjøringen gir en estimert råtefrekvens i dagens hogstklasse 5 på 16,8 prosent, økende til 26,4 prosent etter korrigering for underestimering av total råte ved boring i brysthøyde. Ved å gruppere datamaterialet på bonitetsklasser og aldersklasser (omregnet relativt til hogstmodenhetsalder) framgår at boniteten isolert sett er en lite egnet indikator for valg av hogstalder i gran, når sannsynligheten for råte legges til grunn ved prioriteringen mellom bestand. Ved samme alder relativt til hogstmodenhetsalder (her: nedre aldersgrense for hogstklasse 5), får vi imidlertid som resultat en klart høyere råterisiko for skog på vegetasjonstypene lågurtskog og kalklågurtskog, sammenlignet med øvrige vegetasjonstyper. Som en del av prosjektet har vi også sammenstilt råtedatene fra landsskogflatene i Nord- Trøndelag og de deler av Sør-Trøndelag som ligger på Fosenhalvøya, og analysert råtefrekvensen opp mot konsentrasjoner av grunnstoffer som er ekstrahert fra sand og grus fra mellomstore bekker i regionen. Dataene ble samlet inn i perioden 1983-1985 i forbindelse med Norges geologiske undersøkelse (NGU) sitt Nord-Trøndelagsprogram (Sæter 1987). Konsentrasjoner målt i sedimentprøvene ble aggregert til vassdragsnivå og korrelert mot faktisk (observert) råtefrekvens og mot den uforklarte restvariasjonen i råtefrekvens predikert med modellen (residualanalyse). Et fellestrekk for de korrelasjonene som var signifikante på minst 10%-nivå, er at de fleste var negative (økt konsentrasjon = redusert råte). Blant disse elementene tilhører de fleste (Fe, Ti, Cu, Co og Zr) kategorien transisjonsmetaller i periodesystemet, mens Mg er et jordalkalimetall. Kun P, som er et ikke-metall, var signifikant positivt korrelert med råte. Hylen, G. (Programdeltakelse). 2016. Skogportalen – prioritert i skogmeldinga. nibio.no, 14.10.2016. Tilgjengelig fra: https://www.nibio.no/nyheter/skogportalen--prioritert-i-skogmeldinga?locationfilter=true. Hylen, G., Granhus, A. & Bergland, O. 2015. Decay frequency models for Norway spruce using National Forest Inventory data – preliminary results (Foredrag). SNS Forest Inventory Network meeting, Mariehamn, Åland. Intervju – Finn data om din egen skog! Hylen, G. & Kildahl, K. (Intervju). 2015. Nye kart skal sikre hogst og miljø. Forskning.no, 23.11.2015. Kildahl, K. & Hylen, G. (Intervju). 2015. Nye kart skal sikre hogst og miljø. Nationen, 23.11.2015. Populærvitenskapelig – Skogportalen - et løft for skogbruket og miljøet! Hylen, G. & Vaaje-Kolstad, T. 2015. Skogportalen - et løft for skogbruket og miljøet!. Norsk Skogbruk, (12): 24-25. Kildahl, K., Hylen, G., Ekanger, I. & Kjær, R. (Intervju). 2015. Skogportalen leverer skreddersydd miljøinformasjon. nibio.no, 23.11.2015. Tilgjengelig fra: https://www.nibio.no/nyheter/skogportalen-leverer-skreddersydd-miljinformasjon?locationfilter=true. Bærekraftig skogbruk i Norge. 2014. s. 142-147. Hylen, G. 2014. Skogbrann. I: Tomter, S.M. & Dalen, L.S. (red.) Bærekraftig skogbruk i Norge, s. 142-147. Norsk institutt for skog og landskap, Ås. Skogbranner er hovedsakelig forårsaket av menneskelig aktivitet, mens lynnedslag er den viktigste årsaken til naturlige skogbranner. Tørt, varmt vær over lengre tid gir økt skogbrannfare. Store, ukontrollerte branner setter mennesker og dyrs liv og helse i fare, og kan ødelegge skog, bygninger og infrastruktur. En skogbrann innebærer alt fra lett påvirkning av skogmiljøet, til gjennomgripende endringer i hele økosystemer. For enkelte arter kan skogbrann være en katastrofe, for andre, en nødvendighet for artens videre eksistens. Sommeren 2012 var kald og fuktig, og antallet skogbranner var historisk lavt: 24 registrerte branner førte til 600 dekar brannskadet skogareal. Bærekraftig skogbruk i Norge. 2014. s. 70-75. Hylen, G. 2014. Tilvekst og skogavvirkning. I: Tomter, S.M. & Dalen, L.S. (red.) Bærekraftig skogbruk i Norge, s. 70-75. Norsk institutt for skog og landskap, Ås. Rapport fra Skog og landskap, (11/2013) 2013. 38 s.
Borgen, S.K. & Hylen, G. 2013. Emissions and methodologies for cropland and grassland used in the Norwegian national greenhouse inventory. Rapport fra Skog og landskap (11/2013). 38 s. Norsk institutt for skog og landskap, Ås. Tilgjengelig fra: http://hdl.handle.net/11250/2453859. Every year the Norwegian Forest and Landscape Institute submits the national GHG inventory for the land use, land-use change and forestry sector as part of the National Inventory Report (NIR). The methodology and activity data used to estimate CO2 emissions and removals from cropland and grassland were thoroughly evaluated in 2012 and several new methods were implemented in the 2013 NIR submission. The objective of this report is to present the results of this evaluation and to provide detailed documentation of the new methodologies and the emissions reported in the 2013 NIR submission to UNFCCC for cropland and grassland (CPA, 2013). This report describes four major topics: 1) Method choice for mineral soils. The erosion-based method previously used for mineral soils on both cropland and grassland cannot be considered appropriate. It was replaced by a Tier 2 method for cropland remaining cropland (considering effects of crop rotation, tillage, crop residues and manure inputs) and a Tier 1 method for grassland remaining grassland (considering effects of grassland management practice). 2) Evaluation of the emission factor used for organic soil and the area estimate. A review of Scandinavian literature did not support changing the emission factor value but the areas of cultivated organic soils were re-defined under cropland and grassland. 3) A Tier 1 methodology that can be used to estimate soil carbon stock changes on land-use conversion to grassland and cropland as well as all other land-use change conversion. 4) Uncertainty estimation for all source/sink categories are presented including the use of IPCC default uncertainty estimates when relevant. Hylen, G. 2013. Landsskogtakseringen gir nå full oversikt over all norsk skog. Årsmelding Norsk institutt for skog og landskap, 2012: 29-31. Tilgjengelig fra: http://www.skogoglandskap.no/filearchive/landsskogtakseringen_gir_na_full_oversikt_over_all_norsk_skog.pdf. Oppdragsrapport fra Skog og Landskap, (14) 2012. Hylen, G., Eriksen, R., Granhus, A. & Astrup, R. 2012. Arealrepresentativ overvåking av skog i verneområder. Registreringsopplegg, metodikk og erfaringer fra feltarbeid i 2012. Oppdragsrapport fra Skog og Landskap (14). Norsk institutt for skog og landskap. Tilgjengelig fra: http://hdl.handle.net/11250/2453882. Most European countries have signed the United Nations Framework Convention on climate change and its Kyoto Protocol. Because the European Union is a party to the convention just like the individual countries, there is a need for harmonizing emissions reporting. This specifically applies to the Land Use, Land-Use Change, and Forestry sector, for which harmonized reporting is complex and generally challenging. For example, parties use a variety of different methods for estimating emissions and removals, ranging from application of default factors to advanced methods adapted to national circumstances, such as ongoing field inventories. In this study, we demonstrate that without harmonization, national definitions and methods lead to inconsistent estimates. Based on case studies in Finland, Germany, Norway, Portugal, Slovenia, and Sweden, we conclude that common reference definitions and country-specific bridges are means to harmonize the estimates and make greenhouse gas reporting from forests comparable across countries. National forest inventories (NFIs) are an important source of data for reporting greenhouse gas emissions and removals for the Land Use, Land-Use Change, and Forestry sector as required by the United Nations Framework Convention on Climate Change and its Kyoto Protocol. A major limitation is that NFI resources are generally not sufficient for producing reliable information on year-to-year variation. Interpolation, extrapolation, smoothing, and/or aggregation of data from several years are therefore needed to comply with the reporting requirements for a specific year. Various methods for accomplishing this task are illustrated and evaluated based on data and experiences from the NFIs of six countries, concentrating on the estimation of the stem volume of living trees as a surrogate for tree biomass. Six main conclusions were drawn: (1) NFI data from the target years only were not sufficient for reliable estimation of annual stock change; (2) changes between whole inventory cycles (typically 5 years) could be estimated with reasonable precision; (3) simple moving average estimators of stock are problematic in the estimation of changes; (4) interpenetrating panel designs with permanent sample plots are desirable from the point of view of inter/extrapolating and change estimation; (5) data on annual growth variation and harvests are important and can be used directly in the default method, which is based on differences between increment and drain; and (6) time gaps between NFI surveys may lead to significant errors in the estimation of stock changes. Ressursoversikt fra Skog og landskap, (03) 2012. 85 s.
Granhus, A., Hylen, G. & Nilsen, J.Ø. 2012. Skogen i Norge. Statistikk over skogforhold og skogressurser i Norge registrert i perioden 2005-2009. Ressursoversikt fra Skog og landskap (03). 85 s. Norsk institutt for skog og landskap. Tilgjengelig fra: http://hdl.handle.net/11250/2453896. NINA rapport, (752) 2011. 38 s.
Framstad, E., Stokland, J.N. & Hylen, G. 2011. Skogvern som klimatiltak. Verdifulle skogtyper for biologisk mangfold og karbonlagring. NINA rapport (752). 38 s. Norsk institutt for naturforskning, Trondheim. Tilgjengelig fra: http://www.nina.no/archive/nina/PppBasePdf/rapport/2011/752.pdf. Utvalget av biologisk verdifulle skogtyper er dels basert på viktige naturtyper etter DNs Håndbok 13, på livsmiljøer i skog med høy forekomst av rødlistearter, på prioriterte skogtyper for vern, samt Artsdatabankens rødlistete skogtyper etter inndelingen i Naturtyper for Norge (NiN). Identifi-kasjon og forekomst av disse ulike skogtypene kan dels baseres på underliggende økologiske gradienter, spesielt for næringstilgang og fuktighet, på bioklimatiske gradienter (oseanitet), på skogtilstand (alder) og på forekomst av spesielle terrengforhold eller voksesteder (som bekkekløf-ter). For å gjenkjenne tilsvarende skogtyper med utgangspunkt i Landsskogtakseringens data har vi forenklet kriteriene og tilpasset disse til Landsskogtakseringens parametere som vegetasjons-type, bonitet, alder/hogstklasse, bestandstreslag, og klimasone. Enkelte spesielle naturforhold som bekkekløfter finnes også hos Landsskogtakseringen. Med disse utvalgskriteriene utgjør summen av biologisk verdifulle skogarealer 27% av det totale skogarealet, der lavproduktiv eldre løvskog alene utgjør mer enn 15% av skogarealet og øvrige skogtyper hver utgjør 2-4%. Dette utvalget av skogtyper omfatter også skogarealer med begrenset verdi for biomangfoldet. De biologisk verdifulle skogtypene (definert for Landsskogtakseringens data) har omtrent tilsva-rende betydning som karbonlager og i opptak av CO2 som øvrig skog med tilsvarende produktivi-tet. De største karbonlagrene pr arealenhet finnes i gammel skog, spesielt gammel granskog og eldre løvskog med edelløvtrær, mens lavproduktiv eldre løvskog har lavest karbonlager pr areal-enhet. Summert over arealet av hver skogtype er det imidlertid eldre løvskog, både på lavproduk-tiv og mer produktiv mark, samt gammel gran- og furuskog som representerer de største karbon-lagrene. Årlig CO2-opptak pr arealenhet er knyttet til mer produktiv skog, som rik løv- og barskog og produktiv eldre løvskog, og lavest for lavproduktiv løvskog. Gammel gran- og furuskog og eld-re kystskog har middels CO2-opptak. Summert over hele arealet for hver skogtype er det eldre boreal skog og rik løvskog som har høyest årlig CO2-opptak. Tomter, S.M., Hylen, G. & Nilsen, J.-E. 2010. Development of Norway\"s National Forest Inventory. In: Tomppo, E., Gschwantner, T., Lawrence, M. & McRoberts, R.E. (eds. ): National Forest Inventories. Pathways for common reporting, pp. 411-424. Springer, Heidelberg. ISBN 978-90-481-3232-4. National Forest Inventories. Pathways for Common Reporting. 2010. s. 411-424. Tomter, S., Hylen, G. & Nilsen, J. 2010. Norway. I: Tomppo, E.O., Gschwantner, T., Lawrence, M. & McRoberts, R.E. (red.) National Forest Inventories. Pathways for Common Reporting, s. 411-424. Springer Science+Business Media B.V..
Oppdragsrapport fra Skog og Landskap, (05) 2008. 27 s.
Hylen, G. & Larsson, J.Y. 2008. Helsetilstanden i norske skoger. Resultater fra landsrepresentativ overvåking 1988-2007. Oppdragsrapport fra Skog og Landskap (05). 27 s. Norsk institutt for skog og landskap. Tilgjengelig fra: http://hdl.handle.net/11250/2484439. For alle de observerte treslagene, gran, furu og bjørk, ble det registrert en nedgang i kronetettheten i 2007 i forhold til året før. Dette er det 4. året på rad at det blir registrert en tydelig nedgang for bartrærne, mens for bjørk er det nå 3 år med forholdsvis sterk nedgang i kronetetthet. Når det gjelder misfarging hos observasjonstrærne, er det et mer nyansert bilde. Gran viser en nedgang i andel trær med frisk, grønn kronefarge, mens hos furu og bjørk fant vi en økning i andel trær med frisk, grønn kronefarge. Av skader ble det på gran registrert angrep av granrustsopp på 1,4% av trærne, mens 2,2% av furutrærne var skadet av furubarveps. Av bjørketrærne var 16% skadet av målere. Dødeligheten er generelt lav for bartrærne, mens 39 bjørketrær, noe som utgjør 1,7% av trærne, var døde siden forrige registrering. Kystskogbruket. Potensial og utfordringer de kommende tiårene. Oppdragsrapport fra Skog og Landskap 01 2008. s. 33-38. Hylen, G. & Dalen, L.S. 2008. Klimagasser og skog - ikke med i Kyotoavtalen. Skog gjør Norge mer klimavennlig. Samfunnsspeilet 4: 25-27. Nesten halvparten av Norges utslipp av klimagasser blir tatt opp igjen av skog, i trærnes stammer, greiner, nåler, blader og røtter. Men Kyotoavtalen gir Norge liten mulighet til å trekke skogens opptak av karbondioksid (CO2) fra i klimagassregnskapet. Effekten er også lite omtalt i offentlig debatt. Globalt står avskogingen for 17 prosent av verdens menneskeskapte klimagassutslipp. Hylen, G. 2008. Nye ansvarsområder for Landsskogtakseringen. Årsmelding fra Skog og landskap 2007: 16-17. Oppdragsrapport fra Skog og Landskap, (09/07) 2007. 63 s.
Hylen, G. & Larsson, J.Y. 2007. Helsetilstanden i norske skoger. Resultater fra landsrepresentativ overvåking 1989-2006. Oppdragsrapport fra Skog og Landskap (09/07). 63 s. Norsk institutt for skog og landskap. Tilgjengelig fra: http://hdl.handle.net/11250/2508180. Resultetene for registreringsåret 2006 viser en nedgang i kronetetthet for alle treslagene og i begge aldersgruppene i forhold til 2005. Etter 6 år med bedring i kronetettheten ble det i 2005 registrert en nedgang for bartrærne, en tendens som fortsatte i 2006. Bjørka syntes i fjor å være på vei opp etter 4 år med nedgang. Årets resultater viser imidlertid at den generelle reduksjonen i krontetetthet som vi har sett hos bjørk etter 2001 fortsatte i 2006.Det ble registrert færre misfargede grantrær sammenlignet med året før, og det har siden overvåkingen startet ikke vært registrert en så høy andel av grantrær helt uten misfarging. For furu og bjørk ble registrert en økning i andel misfargede trær. Som forventet er det de eldste trærne som har mest misfarging. Generelt er det lite misfarging hos gran og furu i Norge. Av skader ble det på gran registrert tørkeskader på 0,8% av trærne, mens 0,6% var angrepet av granrustsopp. 4,3% av furutrærne var angrepet av furubarveps, mens 10,4% av bjørketrærne var skadet av fjellbjørkemåler og 8,7% av andre insekter. Dødeligheten er generelt lav. Viten fra Skog og Landskap, (1/07) 2007. 91 s.
Larsson, J.Y. & Hylen, G. 2007. Skogen i Norge. Statistikk over skogforhold og skogressurser i Norge registrert i perioden 2000-2004. Viten fra Skog og Landskap (1/07). 91 s. Norsk institutt for skog og landskap. Tilgjengelig fra: http://hdl.handle.net/11250/2508185. de Wit, H.A., Palosuo, T., Hylen, G. & Liski, J. 2006. A carbon budget of forest biomass and soils in southeast Norway calculated using a widely applicable method. Forest Ecology and Management 225: 15-26. Growing stocks of trees in Europe have increased in a magnitude that is significant in terms of carbon (C) sink strength. Estimates of the soil C sink strength that this increased stock of trees may have induced on a regional scale are scarce, uncertain and difficult to compare. This illustrates the need for a widely applicable calculation method. Here, we calculate a C budget of productive forest in southeast Norway based on forest inventory information, biomass expansion factors (BEF), biomass turnover rates and the dynamic soil model Yasso. We estimate a 29% increase (112-145 Tg) of C in biomass between 1971 and 2000, and estimate the associated increase of C in soils (including dead wood) to be 4.5% (181-189 Tg). The C sink strengths in biomass and soils (including dead wood) in 1990 are 0.38 and 0.08 Mg ha(-1) yr(-1), respectively. Estimated soil C density is 58 Mg C ha(-1) or ca 40% of measured soil C density in Norwegian forest soils. A sensitivity analysis - using uncertainty estimates of model inputs and parameters based on empirical data - shows that the underestimation of the soil C stock can be due to overestimation of decomposition rates of recalcitrant organic matter in the soil model and to including only trees as a source of litter. However, uncertainty in these two factors is shown to have a minimal effect on soil sink estimates. The key uncertainty in the soil sink is the initial value of the soil C stock, i.e. the assumed steady state soil C stock at the start of the time series in 1970. However, this source of uncertainty is reduced in importance for when approaching the end of the data series. This indicates that a longer time series of forest inventory data will decrease the uncertainty in the soil sink estimate due to initialisation of the soil C stock. Other, less significant, sources of uncertainty in estimates of soil stock and sink are BEF for fine roots and turnover rates of fine roots and foliage. The used method for calculation of a forest C budget can be readily applied to other regions for which similar forest resource data are available. Oppdragsrapport fra Skog og Landskap, (08/06) 2006. 45 s.
Hylen, G. 2006. Emissions and removals of greenhouse gases associated by LULUCF in Norway. Documentation of the 2006 submission to UNFCCC. Oppdragsrapport fra Skog og Landskap (08/06). 45 s. Norsk institutt for skog og landskap. Tilgjengelig fra: http://hdl.handle.net/11250/2557582. The Intergovernmental Panel on Climate Change under the UN finalised in 2004 the report “Good Practice Guidance for Estimating and Reporting of Emissions and Removals from Land Use, Land-use Change and Forestry”. The present report describes the data material and the methods used to provide estimates for Norway for the period from 1990 to 2004 in accordance with the good practice guidance. Land-use changes cause changes in carbon storage, thus indirectly emissions and removals of CO2. Removals of CO2 in Norway due to land-use change are relatively insignificant compared to sequestration in existing forest. For 2004, the net sequestration of CO2 from this sector has been estimated at 26 million tonnes, which correspond to about 48% of the total anthropogenic greenhouse gas emissions in Norway. The net sequestration increased by approximately 81 per cent from 1990 to 2004. Oppdragsrapport fra Skog og Landskap, (02/06) 2006. 30 s.
Bloch, V., Flugsrud, K., Gobakken, T., Hylen, G., Rypdal, K. & Tomter, S. 2006. Estimates of emissions and removals resulting from activities under article 3.3 and 3.4 of the Kyoto Protocol. Oppdragsrapport fra Skog og Landskap (02/06). 30 s. Norsk institutt for skog og landskap. Tilgjengelig fra: http://hdl.handle.net/11250/2557584. NIJOS-rapport, (01/06) 2006. 61 s.
Hylen, G. & Larsson, J.Y. 2006. Helsetilstanden i norske skoger. Resultater 1989-2005. NIJOS-rapport (01/06). 61 s. Norsk institutt for jord- og skogkartlegging, Ås. Tilgjengelig fra: http://hdl.handle.net/11250/2557569. NIJOS har ansvaret for den landsrepresentative skogovervåkingen under det nasjonale Overvåkningsprogram for skogskader. Denne rapporten gir en oversikt over sunnhetstilstanden til bar- og bjørketrær for landets skogareal for år 2005 samt utviklingstendenser over tid for utvalgte kroneregistreringer. Trekronene til gran og furu var noe mer glisne i 2005 i forhold til året før, mens for bjørka var det en liten forbedring. Etter 6 år med bedring i kronetettheten ble det i 2005 registrert en nedgang for bartrærne, mens bjørka synes å være på vei opp etter 4 år med nedgang. For både gran og furu ble det registrert en mindre grad av misfarging enn året før, og for bjørk var bedringen på nesten 9%-poeng. Eldre trær har lavere kronetetthet og mer misfarging enn yngre trær. Av skader ble det på gran registrert angrep av granrustsopp på 4,1% av trærne, mens 8,1% av bjørketrærne var skadet av fjellbjørkemåler. Av furutrærne var 1% skadd av furubarveps. Dødeligheten er generelt lav. Fjellskogen og skogen i Sør- og Nord- røndelag har lavere kronetetthet, større andel trær med misfarging og er generelt eldre sammenlignet med alle registrerte trær i hele landet. NIJOS-rapport, (01/05) 2005. 66 s.
Hylen, G. & Larsson, J.Y. 2005. Landsrepresentativ overvåking av skogens vitalitet i Norge 1989-2004. NIJOS-rapport (01/05). 66 s. Norsk institutt for jord- og skogkartlegging. Tilgjengelig fra: http://hdl.handle.net/11250/2557709. NIJOS-rapport, (01/04) 2004. 77 s.
Hylen, G. & Larsson, J.Y. 2004. Landsrepresentativ overvåking av skogens vitalitet i Norge 1989-2003. NIJOS-rapport (01/04). 77 s. Norsk institutt for jord- og skogkartlegging, Ås. Tilgjengelig fra: http://hdl.handle.net/11250/2558470. NIJOS har ansvaret for den landsrepresentative skogovervåkingen under det nasjonale Overvåkningsprogram for skogskader. Denne rapporten gir en oversikt over sunnhetstilstanden til bar- og bjørketrær i landets skogareal for år 2003 samt utviklingstendenser over tid for utvalgte kroneregistreringer. Trekronene til gran og furu ble tettere i 2003 mens bjørka holdt seg på samme nivå som i 2002. Den årlig nedgang i kronetetthet for gran og furu fra 1989 til 1998 er brutt. Fra 1999 til 2003 har kronetettheten økt. Flere furu- og bjørktrær hadde frisk grønn farge, mens flere grantrær hadde mer enn 10% misfarging i krona sammenlignet med året før. Eldre trær har lavere kronetetthet og mer misfarging enn yngre trær. Skader fra lauvspisende insekter var registrert på 36,6% av bjørketrærne. Dødeligheten er generelt lav. Fjellskogen og skogen i Sør- og Nord-Trøndelag har lavere kronetetthet, større andel trær med misfarging og er generelt eldre sammenlignet med alle registrerte trær i hele landet. NIJOS-rapport, (01/03) 2003. 65 s.
Hylen, G. & Larsson, J.Y. 2003. Landsrepresentativ overvåking av skogens vitalitet i Norge 1989-2002. NIJOS-rapport (01/03). 65 s. Norsk institutt for jord- og skogkartlegging, Ås. Tilgjengelig fra: http://hdl.handle.net/11250/2558850. NIJOS har ansvaret for den landsrepresentative skogovervåkingen under det nasjonale Overvåkningsprogram for skogskader. Denne rapporten gir en oversikt over sunnhetstilstanden til bar- og bjørketrær i landets skogareal for år 2002 samt utviklingstendenser over tid for utvalgte kroneregistreringer. Gjennomsnittlig kronetetthet for gran og bjørk økte svakt, mens den var uforandret for furu sammenlignet med året før. Gran og furu fikk grønnere kronefarge. 10% av bjørketrærne hadde misfarging i mer enn 10% av kronen. Det er ikke registrert så stort omfang av misfarging på bjørk i hele overvåkingsperioden. En stor andel bjørketrær ble registrert med bjørkerustsopp og/eller med lauvspisende insekter. Dødeligheten for alle de registrerte treslagene var på samme nivå som tidligere år. NIJOS rapport, 06/03 2003. 55 s.
Tomter, S., Eriksen, R., Ludahl, A. & Hylen, G. 2003. Resultatkontroll Skogbruk/Miljø, Rapport 2001 - Hovedtall og utviklingstendenser for skogen i fylkene: Østfold, Oslo/Akershus, Hedmark, Aust-Agder, Vest-Agder og Nord-Trøndelag.NIJOS rapporter 06/03: 55 s.
Del I av rapporten er en presentasjon av data for enkelte fylkestakster som utføres i forbindelse med Landsskogtakseringen. Det er data fra fylkene som ble taksert i 7. omdrev som er presentert. Dette gjelder for fylkene Østfold, Oslo/Akershus, Østfold, Aust-Agder og Vest- Agder, Nord-Trøndelag og Hedmark. Registreringene er utført med markarbeid fra om med 1995 til og med 1999. Hovedtendensen for alle fylkene er en økning i antall gamle trær og antall grove trær over tid. Videre i del I er det presentert data for overvåking av skogskadeprogrammet. Skogens vitalitet, vurdert ut fra kronetetthet, kronefarge og dødelighet, har ikke endret seg sterkt gjennom overvåkingsperioden, men har hatt regionale mønstre for tilstand og utvikling hvor Trøndelag og det indre Østlandet har skilt seg ut i negativ retning både for gran, furu og bjørk. Det geografiske mønsteret i skogens vitalitet, og variasjonene over tid, samsvarer ikke med det geografiske mønsteret en skulle forvente å finne ved skader av luftforurensninger. De norske resultatene for kronetilstanden tilsvarer utviklingen ellers i Europa. Men Trøndelag framtrer også i europeisk sammenheng som en region med relativt mye kroneutglisning. I forhold til de andre nordiske landene har Norge noe høyere andel av trær med utglisning. Alle forhold tatt i betraktning synes det rimelig å anta at de undersøkte skogøkosystemene i Norge har en rimelig god status. Del II av rapporten omfatter resultater fra aktivitetskontrollen i 2001. Det har ikke blitt foretatt noen vesentlige endringer i registreringene for 2001 sammenliknet med tidligere år. Årets rapport innholder imidlertid ikke resultatene fra kontroll av skogbruksplanlegging. Dette skyldes at dagens kontrollsystem kan virke misvisende da skjemaet ikke er tilpasset dagens systemer. I tillegg er rapporteringen fra fylkene mangelfull slik at en statistikk på denne bakgrunnen kunne virket villedende. Resultater fra foryngelsesfelt kontrollen blir presentert først. Feltene som blir plukket ut for kontroll har blitt hogd to år tidligere, altså i 1999. I forhold til de skogbruksfaglige vurderinger synes kontrollen tilfredsstillende. Kontrollen viser at forskriftenes bestemmelser i all hovedsak er fulgt på dette punkt. Det totale hogstfeltarealet i 2001 er estimert til 425.000 dekar. Dette er en nedgang sammenliknet med tidligere år, med unntak av 1996. Da var det totale hogstfeltarealet på 414.000 dekar. Foryngelses metode som er benyttet fordeler seg også arealmessig omtrent som tidligere år. Planting er fortsatt den vanligste foryngelsesformen og blir benyttet på nesten halvparten av arealet. Av hogstformer som har blitt benyttet er snauhogst fortsatt dominerende og blir benyttet på 68% av arealet. Dette er en økning sammenliknet med tallene fra 2000, men da lå andelen fjellskoghogst relativt høyt. Hogstformen er imidlertid vurdert som riktig på 98% av arealet. Resultatene for kontroll av skogsbilveier viser at antall kilometer nyanlegg vei er blitt redusert med nesten 80% fra 1990 og frem til 2001. Dette har sammenheng med at vegnettet i mange områder, spesielt i skogstrøkene, etter hvert begynner å bli bra utbygd. Det er imidlertid også et resultat av fallende lønnsomhet og redusert investeringsvilje i næringa. Doctor Scientiarum Theses. Norges landbrukshøgskole, 2002/30 2002. flere pag. Hylen, G. 2002. Genetic variation of wood density and its components and their relationships with growth traits in young Norway spruce (Picea abies (L.) Karst). Implications for breeding. Doctor Scientiarum theses. Norges landbrukshøgskole 2007/30: flere pag. NIJOS rapport, 1/02 2002. 64 s.
Hylen, G. & Larsson, J.Y. 2002. Landsrepresentativ overvåking av skogens vitalitet i Norge 1989-2001. [National monitoring of forest vitality in Norway 1989-2001]. NIJOS rapport 1/02: 64 s.
NIJOS-rapport, (01/01) 2001. 55 s.
Hylen, G. & Larsson, J.Y. 2001. Landsrepresentativ overvåking av skogens vitalitet i Norge 1989-2000. NIJOS-rapport (01/01). 55 s. Norsk institutt for jord- og skogkartlegging, Ås. Tilgjengelig fra: http://hdl.handle.net/11250/2559795. NIJOS har ansvaret for den landsrepresentative skogovervåkingen under det nasjonale Overvåkningsprogram for skogskader. Denne rapporten gir en oversikt over vitaliteten til bar- og lauvtrær i hele landets skogareal samt utviklingstendenser over tid for utvalgte registreringer. I 2000 er kronetetthet og kronefarge, samt andre parametre registrert på 9845 trær som er fordelt på 953 flater. Gjennomsnittlig kronetettheten for gran var 81,3%, furu 83,7% og bjørk 76,4%. Kronetettheten for alle undersøkte trær av gran og furu har samlet sett vist en nedadgående tendens fra 1989 til 1997. Med økning i kronetetthet for de tre siste årene synes den negative utviklingen å være brutt. I 2000 var det en nedgang i andelen trær med frisk grønne krone for både gran og bjørk sammenlignet med året før, mens det var en økning for furu. Det totale antall furutrær med frisk grønn kronefarge er det største siden registreringene startet. Kronefargen for gran var relativt stabil fram til 1995, mens den de siste fire årene har variert fra år til år. Det er spesielt eldre grantrær som er registrert med misfarging. NIJOS-rapport, (13/00) 2000. 47 s.
Hylen, G. 2000. Landsrepresentativ overvåking av skogens vitalitet i Norge: Kontroll 1999. NIJOS-rapport (13/00). 47 s. Norsk institutt for jord- og skogkartlegging, Ås. Tilgjengelig fra: http://hdl.handle.net/11250/2559924. Etter avsluttet registreringer av den årlige takseringen av skogens vitalitet ble førti flater som var taksert av fire tilfeldig valgte observatører, retaksert av kontrollør. Kontrolltaksten bidrar til å dokumentere kvaliteten på feltarbeidet, avdekke uklarheter i feltinstruksen, og den er et ledd i å kalibrere feltpersonellets vurderinger. Observatørene har lavere gjennomsnittlig kronetetthet for trær og flatemiddel for gran sammenlignet med kontrollør, men det er motsatt for furu og bjørk. En observatør har fastsatt kronetettheten signifikant forskjellig fra kontrolløren for alle treslagene. Hver observatør kan ha en individuell standard som de bedømmer trærne etter. Både observatør og kontrollør benytter hele skalaen i bedømmelse av kronefarge. Kontrolløren benytter fargeklasser med sterkere intensitet for alle treslag sammenlignet med verdiene til observatørene. Begge bruker få fargeklasser i bedømmelse av bjørk. Kontrolløren oppsøker flatene på et senere tidspunkt enn observatørene og den naturlige variasjonen i gulfarge som foregår gjennom vekstsesongen, kan sannsynligvis forklare en stor del av forskjellene. Generelt er det registrert relativt få skader på artene. NIJOS-rapport, (01/00) 2000. 66 s.
Hylen, G. 2000. Landsrepresentativ overvåking av skogens vitalitet i Norge 1989-1999: Statistikk. NIJOS-rapport (01/00). 66 s. Norsk institutt for jord- og skogkartlegging, Ås. Tilgjengelig fra: http://hdl.handle.net/11250/2559925. NIJOS har ansvaret for den landsrepresentative skogovervåkingen under det nasjonale Overvåkningsprogram for skogskader. Denne rapporten gir en oversikt over vitaliteten til bar- og lauvtrær i hele landets skogareal for 1999 samt utviklingstendenser over tid. I 1999 er kronetetthet og kronefarge registrert på 9767 trær som er fordelt på 929 flater. Resultatene i 1999 viser en økning i kronetetthet på 1,2%-poeng fra 1998 til 1999 for gran som nå har kronetetthet 80,6%. Kronetettheten for furu har økt med 1,1%-poeng til 82,4%, mens det var ingen forandring for bjørk (74%). Gjennomsnittlig kronetetthet for alle undersøkte trær av gran og furu har samlet sett vist en nedadgående tendens fra 1989 til 1997. Med økning ikronetetthet både i 1998 og 1999 synes den negative utviklingen å være brutt. Andelen grantrær med misfarging var relativt stabil fram til 1995, mens den de siste fire årene har vært større og varierende. Andelen av grantrær med misfarging var i 1999 19,1% mot 23,3 % i 1998, og for furu er tallet 4% mot 4,9% i 1998. Det er hovedsakelig eldre trær som er registrert med gulfarge. For bjørk var det ingen forandringer i andelen trær med misfarging i 1999 sammenlignet med 1998. Hylen, G. 1999. Age trends in genetic parameters of wood density in young Norway spruce. Canadian Journal of Forest Research 29: 135-143. Age trends of phenotypic, environmental, and additive genetic variance and heritability were estimated for overall density and its components earlywood and latewood densities and latewood proportion. The objective was to acquire information for both individual and cumulated rings from ring number 3 to 12 counted from the pith. Age-age correlations were calculated for cumulated density traits only. The wood density data were obtained with X-ray analysis of increment cores from 47 open-pollinated families of Norway spruce (Picea abies (L.) Karst.). The families had earlywood and latewood with significant differences in density for individual and cumulated rings and consequently for overall density. The latewood proportion had significant family variation for cumulated rings but not for all individual rings. Large fluctuations in environmental variance caused fluctuations in heritability estimates for successive rings. A strong decrease in environmental variance for all cumulated traits, especially from ring 3 to 5, resulted in a steady increase in heritability estimates. The latewood density had the highest heritability estimates and latewood proportion the lowest for both individual and cumulated rings. Overall density and the cumulated components at cambial age 12 showed strong genetic correlations with their respective traits at all younger ages. NIJOS rapport, 14/99 1999. VIII, 44 s.
Hylen, G. & Ludahl, A. 1999. Landsrepresentativ overvåking av skogens vitalitet i Norge - kontroll 1998. NIJOS rapport 14/99: VIII, 44 s.
NIJOS rapport, 20/98 1998. XV, 80 s.
Hylen, G. 1998. Landsrepresentativ overvåking av skogens vitalitet i Norge 1989-1998. Statistikk. NIJOS rapport 20/98: XV, 80 s.
Hylen, G. 1997. Genetic variation of wood density and its relationship with growth traits in young Norway spruce. Silvae Genetica 46: 55-60. Meddelelser fra Skogforsk, 47.10 1996. 22 s.
Hylen, G. 1996. Variation in basic density and its relationship to diameter and pilodyn penetration in provenances of Norway spruce (Picea abies). Meddelelser fra Skogforsk 47.10: 22 s.